Carlos Llerena Aguirre had left for the United States in the late seventies, shortly after seeing his career as a law student at Universidad Nacional Federico Villarreal in Lima. It made it difficult for us to be aware of his artistic process. 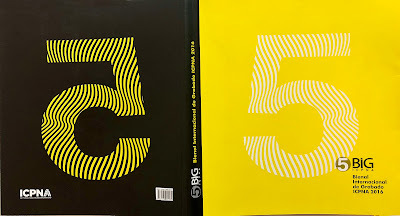 For this reason, the exhibition Fibra y Acero is a true revelation for both the Lima public and for the Peruvian critics and curators active during the last 20 years. 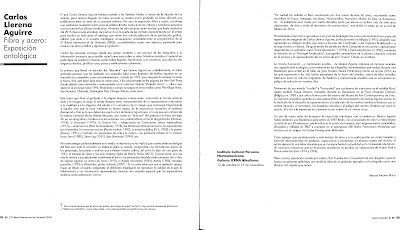 At least it has been like this for those who write, that until the middle of 2015 I was unaware of Carlos' work and I was lucky to be personally invited by the artist to write a text for the catalog that has a large selection of his graphic production, which together to the anthological sample, undoubtedly enriched the programming of the 5th International Engraving Biennial (5BIG), consolidating it as a relevant instance to reveal a prolific and rigorous work recorded. Carlos was patient with me from that first contact and provided me with the photographs and information necessary to write that brief text about his work. While reviewing the material I could not stop celebrating my good luck: I had literally arrived at my desk, a work of high technical demand, prolific as few and aesthetically coherent. 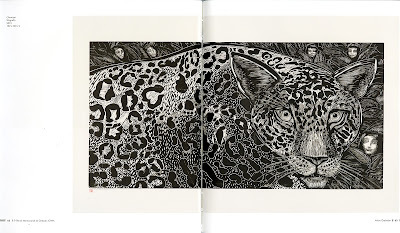 The first thing that caught my attention was to "discover" that Llerena Aguirre is probably the only Peruvian engraver who has done a sustained job as an illustrator of printed media in a market as competitive as the North American: started in 1973, shortly after moving to New York, this work lasted more than 20 years. And it was precisely in the pages of the New York Times where he debuted as an illustrator --- curiously with the picture titled "Dictador Choro" ---, a job whose exercise lasted until 1996, taking him to to fulfill assignments in other media such as The Village Voice, San Francisco Chronicle, Washington Post, Chicago Tribune, among others. 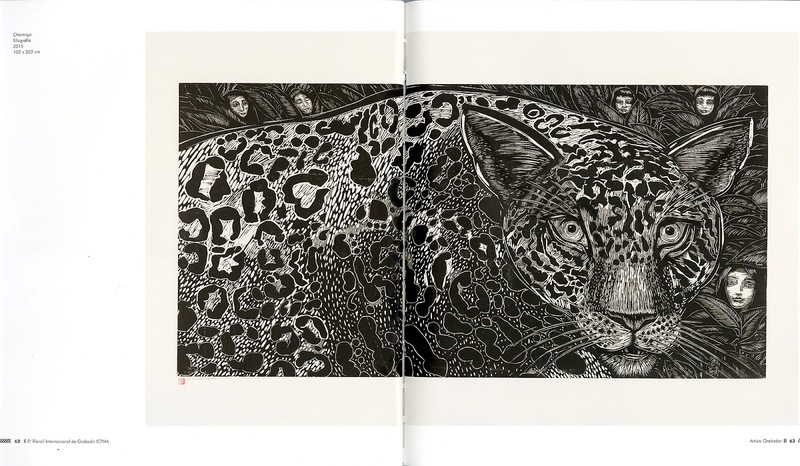 This work that took the engraving to the massively printed page, renewed the link between the text and the image, demands from the artist several challenges, transporting from naturalistic representation to metaphor and allegory; from the portrait to the caricature; of the image that moves tragically to that other one that does it by means of its black humor; from the surrealist reverie to the stark realism. This is what determined that Llerena's work is. 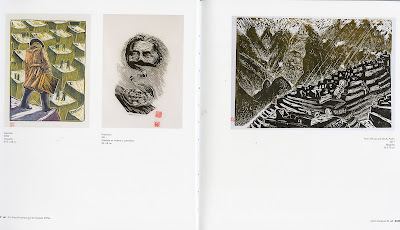 At the same time that a chronicle of the universal history of the last decades, a sort of "binnacle" of the engraver of the late twentieth century: in his xylographs and linoleum we find problems such as drug addiction (Heroine, 1974), Euthanasia (1975), The Cold War --- Allegorized in Communism versus Imperialism (1977) - Terrorism (Paris bombed, 1978), Latin American dictatorships, oil speculation. The nuclear threat (Nuclear plant, 1982), the war industry (F16, 1983) or the war (Bosnia, 1991); and also with characters of art and culture, with particular emphasis on music Isaac Stern (1980), Steve Lag (1981), Igor Stravinsky (1994), etc. But this professionally rooted in the American environment did not imply that our artist leaves Peru but quite the opposite: the distance refines his look, giving him a clarividence about the characters, locations and motives that synthesize our culture. As one piece from 1981 shows, the Qero’s Varayok or the most recent Views of Machu Picchu (2011). Interestingly, once again the music and its performers will constitute the theme and decidedly Peruvian characters of the work of Llerena Aguirre: La Antara de Urcos (1975), The enchanted harp (1981), Antara (1985), Guardian ancestor, (1995) or Red Chested Wanchako ­­(2011). It is in these prints that the engraver seems to make a tribute to the indigenista spirit: the detail displayed in reproducing the quality of the skin, the clothing and the instruments represented. They denote a special empathy that the spectators feel like admiration and fervor. “In fact I have visited Peru annually for two months for 40 years, traveling with backpacker Cuzco, Arequipa, Apurímac, Huancavelica, Ayacucho, Madre de Dios, the Amazonas, etc. If you multiply those months by four decades it means that I was in Peru seven additional years. I have seen and experienced the terrorism of our land, "
Precisely the terrorism that was one step away from disintegrating as a country is also part of the repertoire of images of Carlos Llerena Aguirre, particularly The Miracle (1991), xylography that represents an anguished Golgotha ​​that gathers at the feet of the Crucified -? Taytacha of the Earthquakes ? - or hooded and musicians. 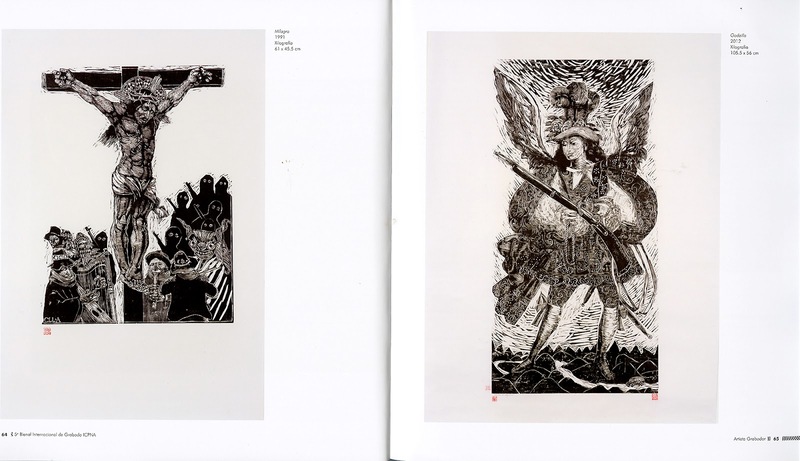 In the same way, the paradoxes of the Conquest are cryptically allegorized in engravings such as Transculturation 1 (1994) and Transculturation 2 (1996), through the inclusion of an "Archangel Arcabucero", a characteristic iconography of Cusco’s painting style. Virreynal in the first one and the representation of the ruins of a "Huaca" Chimu, in the last. 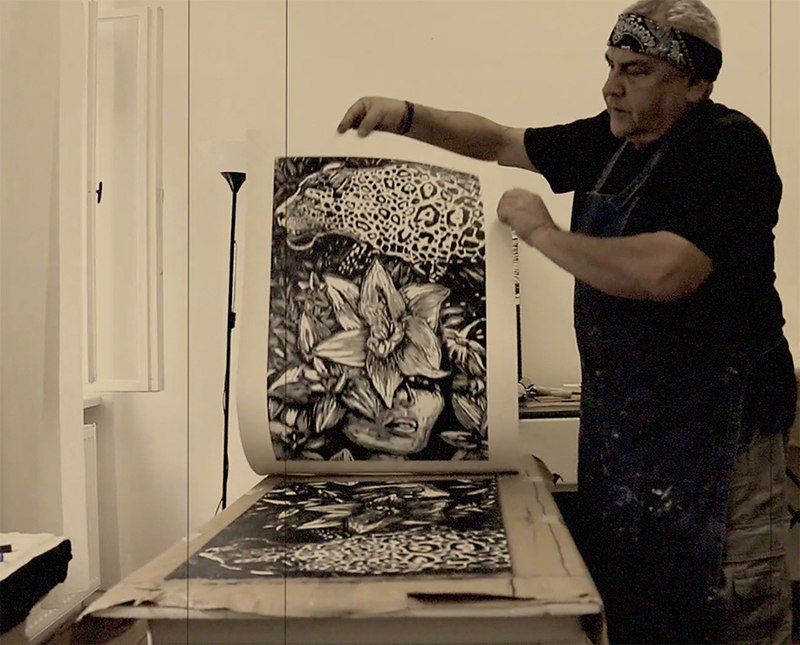 The humanist - and certainly erudite - look of Llerena Aguirre acquires an ecological specialty in recent times, punctually in the monumental woodcuts that he made during a residency for artist in the Venice Printmaking Studio large format workshop in 2014. In which It represents the most beautiful examples of the fauna of the planet, several of them totemic animals for the original cultures of America and precisely those that are in danger of extinction these days. 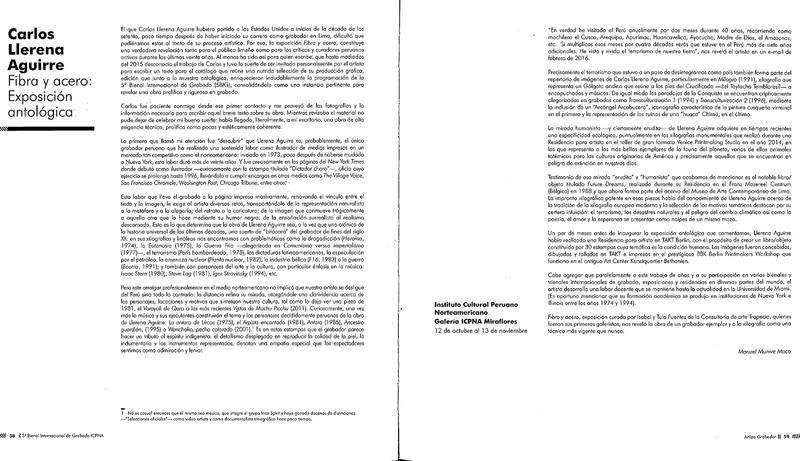 Testimony of that "erudite" and "humanist" look we just mentioned is the remarkable book / object titled Future Dreams, made during his residency at the Franz Masareel Centrum (Belgium) in 1988 and now part of the collection of the Museum of Art Contemporary of Lima. l The evident xylographic imprint of these pieces speaks of Llerena Aguirre's knowledge of the tradition of modern European woodcut and the selection of the thematic motifs stand out for their accurate intuition: terrorism, natural disasters and the danger of climate change as well as poetry, love and hope are presented as cards of the same deck. A couple of months before opening the anthological exhibition that we discussed, Llerena Aguirre had made an Artist Residence in TAKT Berlin, with the purpose of creating a book / object consisting of 30 prints whose theme is the human condition. 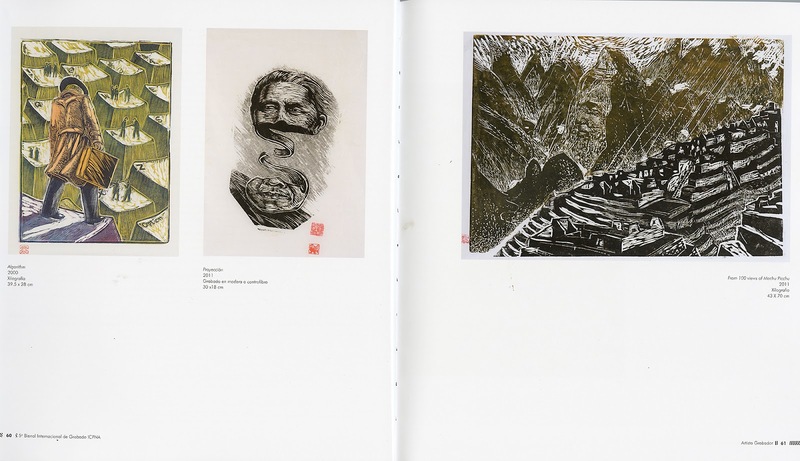 The images were conceived, drawn and carved in TAKT and printed in the prestigious BBK Berlin Printmakers Workshop that works in the old Art Center Kunstquartier Bethanien. It is not by chance then that he himself is a musician, that he is a member of the Inca Spirit group and has won dozens of distinctions - "Official selections" - as a video artist and as an ethnographic documentary maker a short time ago.